We make our heroes what we need them to be. For Edward Blum, what the world needs now is a religious W.E.B. Du Bois. Such a Du Bois would not only be a historical marker in the history of African American intellectual life, or an intriguing artifact of turn-of-the-century African American sociology, but also would offer a usable model for the religious liberal in the modern world. W.E.B. Du Bois, American Prophet provides more than an examination of the religious keywords within the massive corpus of Du Bois' output. It proposes that a religious ontology for racial reconciliation might be gleaned from this survey. Yet this received account collapses under the weight of counter-evidence discovered by Blum. After all, religion abounded in Du Bois' life: he taught Sunday school classes, had favorite hymns, founded the study of African American religion, and cried out for the "Prince of Peace" to "vanquish the warmongers." He authored prayers and befriended many clerics. Most important to Blum is the religious language pervading Du Bois' bibliography. God, Christ, female messiahs, good and evil, and apocalyptic visions pervade the texts of W.E.B. Du Bois. In Blum's rendering, The Souls of Black Folk supplied "a literary act not only of theological and cultural defiance but also of religious creation." W.E.B. Du Bois, American Prophet shows that whatever Du Bois was, he most certainly was not dismissive of religion. If anything, the material of this volume suggests he was obsessed by it. Blum organizes his tackle of the Du Bois bibliography by genre: autobiographies, The Souls of Black Folk, Du Bois' historical and sociological studies, his poems and fiction, and his advocacy for Communism. Each pile of subdivided primary material is trolled for invocations of theology, religious imagery, and moral formulations. 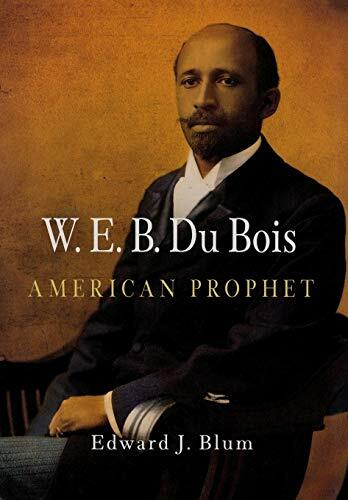 From this pursuit, Blum creates "one of America's most profound religious thinkers," a Du Bois whom Blum calls "the nation's holy seer" and one of American history's "brightest religious stars." Within the writings of a man deemed irreligious by some, Blum finds "multiple religious selves": reformer, apostate, prophet, agnostic, and priest. Blum imagines a Du Bois who consistently used religion, in his life and work, as a framing mechanism for an iconoclastic moral imaginary. Central to this imaginary for Du Bois was the race problem. "Seeing the religious drama of American and black history through his prophetic eyes," writes Blum, "[Du Bois] contended that African Americans had access to the divine and were holy." By contrast, whites were complicit with an obscuring of Christ's racialized identity. In his fictional writings, Du Bois "linked Christ's crucifixion with the lynching of African American men and drew on a variety of religious concepts to reveal the democratic spirit of white America and to reassure the black community of its access to the sacred and divine." In a 1913 article in The Crisis, for example, Du Bois wrote that Christ "was poor and we are poor; He was despised of his fellow men and we are despised; He was persecuted and crucified, and we are mobbed and lynched." Du Bois devoted quite a bit of ink to the deconstruction of the white god and the rituals bent on idolizing this god. This wasn't the project of an elitist gadfly. For Du Bois, antagonizing white Christianity was the task of every black American. His individual "prophetic calling" was part of the "the larger anointed status of all black people." African Americans had a "messianic role" to guide America to Christian ground. Like black intellectuals before him, Du Bois denounced white Christians as inauthentic Christians, blasphemers who used Christian language to mobilize an evil ideology of segregation and oppression. Melded with this was a social scientist's delight in Christ's own racial complexity, since the latest research suggested to Du Bois that Jesus was a "Syrian Jew" who may have "even inherited Ethiopian blood."